Here are some photographs giving a bird's eye view of a part of the vast metropolitan city of Mumbai, India's commercial capital. 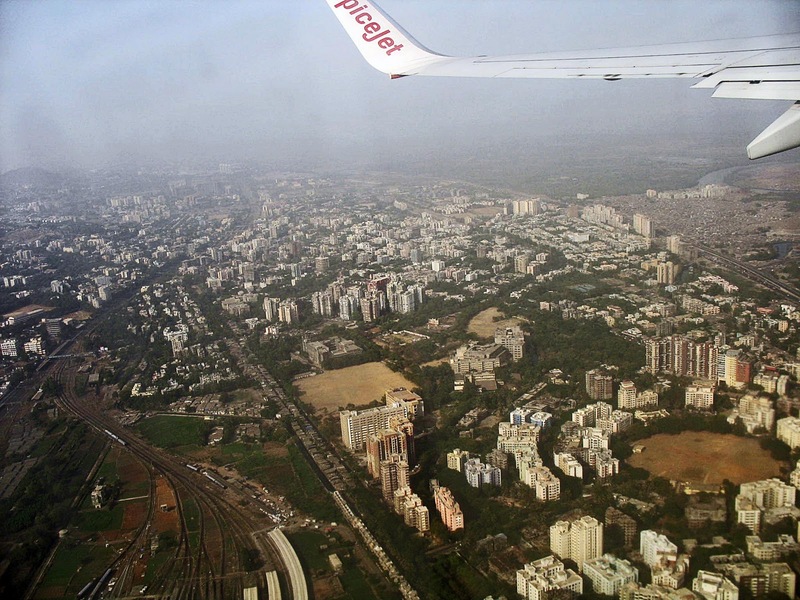 These photographs were taken after take-off from Mumbai's Santacruz airport on Spicejet. In the first photo you can see that the plane was flying over a railway yard which is visible at the bottom half of the canvas. A goods train, a local subway train as well as a train station can be seen in the lower left hand corner once the photo is seen in its enlarged format. This blueprint shows an area to the right of the area shown above. Housing colonies with a playground inbetween can be seen to the right of the picture. At the top of the photo you can see the wing of the plane, Spicejet. Inbetween the railway yard and the colony a row of slums can be seen. We are now rapidly leaving Mumbai, going towards the sea. This is an aerial view of the Western Express Highway. Cars and heavy vehicles can be seen plying on the road. The highway is surrounded by buildings, a patch of greenery and slums. This shows an area further up, to the right. Buildings and housing colonies can be seen, and a row of slums are visible to the left of the photo. The vastness of the slums doesn't hit you until you see it from the air. 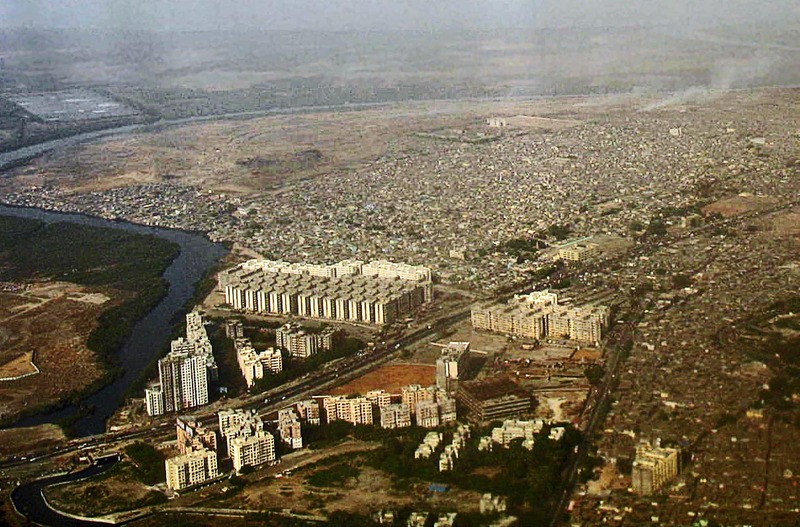 The Western Express highway is to the extreme left of the image, and beyond that to the right a large patch of slum can be seen stretching out into the distance. There is some marshy land beyond it just before the land touches the sea. Nullas or rivulets leading up to the sea curve their way across. Just look at those slums! 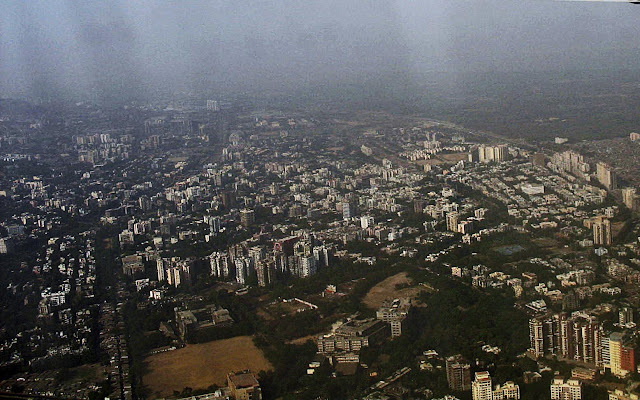 We were flying out of Mumbai but this over populated city's dense population is visible even here, on the outskirts. How can these be the Dharavi slums, which are the largest in Asia? Surely we must have passed them earlier? Am not sure which slums these are. The sea can be seen at the top of the image. Here is a closer look at the slums, each hut packed like a sardine in a tin or worse. The urban slums don't look much better, the building so close together that one wonders if there is space for a road between the buildings. Again, one wonders whether these are the Dharavi slums? If any reader knows please do comment. In this image the ground appears to be closer but the photograph was taken after the previous ones. Probably the plane was at an angle. In this picture the smudgy window panes of Spicejet are visible. In the others I managed to fix it. All the pictures in this post were shot on the way out of Mumbai. 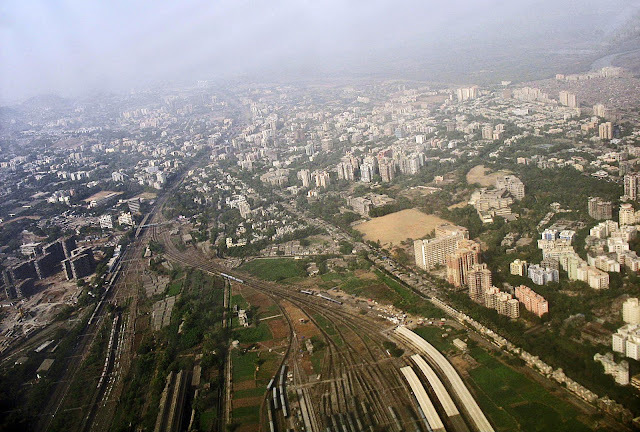 Photographs while landing in Mumbai (a different view) will be presented in another post. 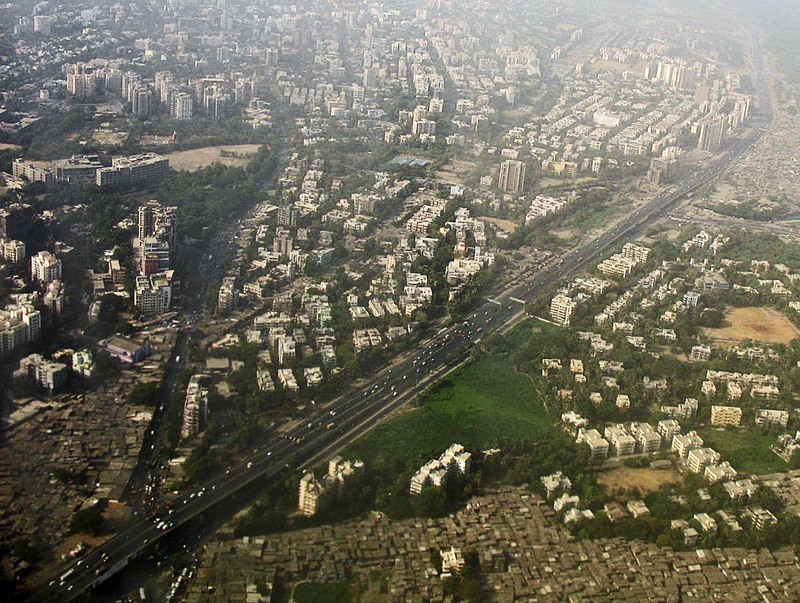 For more pictures of the city try the label "Mumbai"
The slums are not Dharavi. 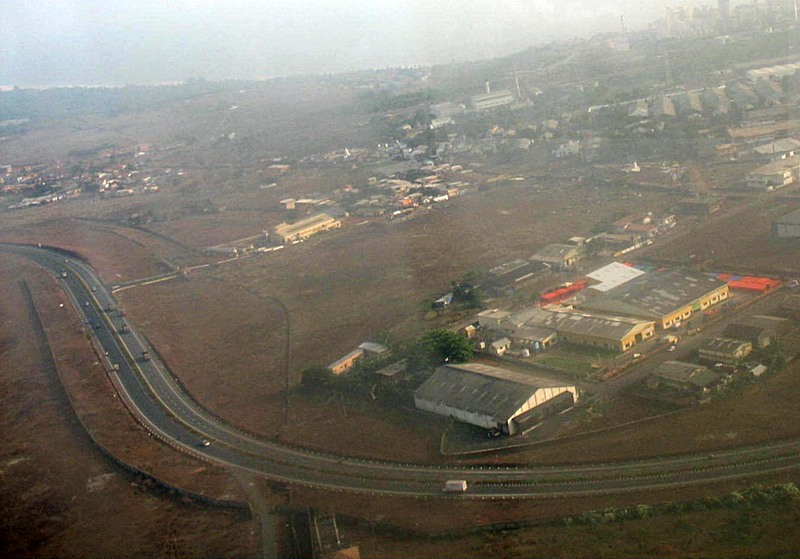 Dharavi is south of Mumbai airport. 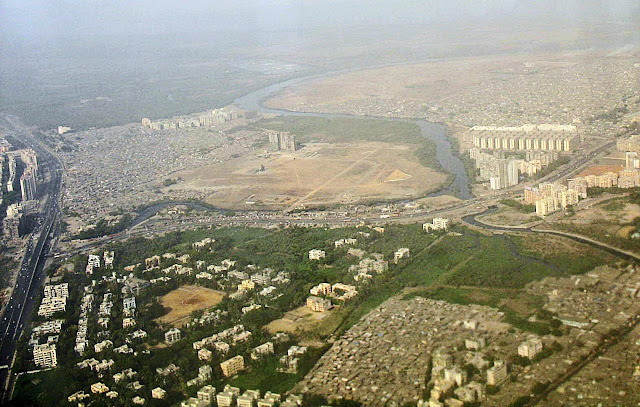 These slums are north of the airport. 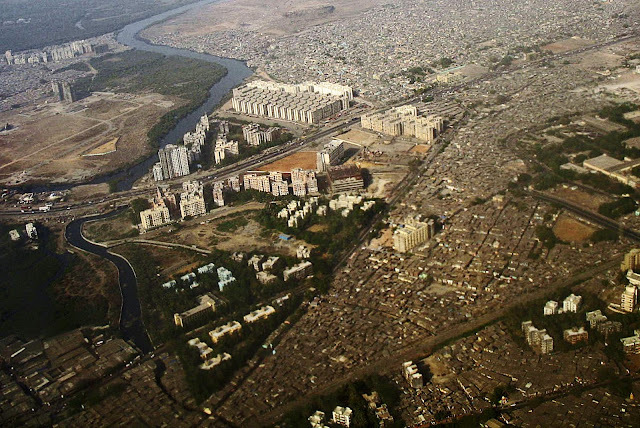 Interestingly these slums [as a continuous stretch] are far larger than Dharavi [confirm in google earth]. The uniform blocks of higrises within the slums are slum rehab projects. But they have not been very successful because of opposition by social(ist) activists. Thanks a lot for your comment. I thought as much, that this is not Dharavi. It's shocking that these slums are larger than the Dharavi slums which people think is the largest slum in Asia. And to think India is going to be ***SUPERPOWER***??? WHAT A JOKE. India has to worse than most African countries.